Thank you to Creative Cuts & More! Happy Monday - hopefully your weekend was a nice one. We just BBQ'd, probably for the last time. It gets pretty brisk and windy up here on our hillside in the colder months. I'm not sure where the months of September and October have gone. It seems like just yesterday, I got my order in from Creative Cuts & More, and my two months as guest DT member began. I want to say that Terri, and her team at CC&M were wonderful to work with. Their products are outstanding. I've not found anything yet that was not easy and amazing to create with. Thank you, everyone at CC&M for making my time so enjoyable! I have two projects for you today, using their products. The first is a color-blocked card. I chose to use the cream base, with an orange grid. I had a good time testing many of my forgotten stamps, trying to find the right fit for the openings. Stamps are Inkadinkado and Hero Arts. Coloring was done using colored pencils and mineral spirits. The Designer Paper was from an Autumn Mat Stack by DCWV. This next project was fun to make. I started with the Apron Die Cut. Added some great designer paper from The Paper Studio. Mmmmm....Pumpkin Pie? Who can resist that? Added a Tag Die Cut, a sentiment from Hero Arts, and a bit of green seam binding ribbon from Stampin' Up. Next, out came the Copics, and Pie Birgitta from C.C. Designs - how perfect is she with the pie papers??? Too much fun! Once again, thanks to Terri, Dawn, and the crew at Creative Cuts & More. You are the best! Have a great week, everyone! I'll be back tomorrow with a CAS card for Christmas! If you are looking for something that will lay flat for mailing, and mass produce like one, two, three, be sure and check back! Then, on November 1st, it's New Release Day for Digi's at the Doodle Pantry!!! Laurie has some amazing new images for you! Hope to see you on the 1st! And how about those Cardinal's? Early in the game, I couldn't figure out if we were watching Little League, or the Bad News Bears, but wowee - guess it's that final score that matters! I have a little Frankin' Fun for you today, from My Time Made Easy. This is one of Lauren's great digi images. I have to tell you that my Halloween stamps are very limited. So when I saw this cute digi a couple of weeks ago, I grabbed it. I'd actually forgotten it, when their sketch challenge was posted. Decided to give myself a bit of creative therapy yesterday, and color it up! Here's what I did with the sketch - turned it on the end, and in place of a ribbon and bow, I used cardstock strip and bats. The cardstock is all from the Authentique "Glowing" collection, which I purchased from Joan's Gardens. The teensy little bats are from Amuse, which my friend Shirley sells. Aside from the Bazzilll Basics card itself, that's it! Easy, peasy....cheap therapy! Coloring is done with Copics, sponging with several colors of Tim Holtz Distress Inks. Hope your day is wonderful - thanks so much for stopping by! Food for thought: People take lots of different roads in life. Remember that just because they aren't on your road, doesn't mean that they are on the wrong road. I'm not sure how we are halfway through this week already, but wahoo for the upcoming weekend! Hope you are all having a great week, and have some fun things planned for the weekend. So, I was sneaking around looking at blogs a few weeks ago, and I came across Lorri Heiling's blog. When I did, the first thing that caught my eye was this fabulous project. Masculine cards are difficult for me, as I love ribbon and bling, and I was in need of a man's birthday card/project for the 28th, so I decided to take the plunge. It looks rather difficult, but this lady has a wonderful tutorial, that has dimensions and photos for every single step. It was easy peasy. The toughest thing was not having any 'tool' stamps. Had to draw and improvise. I want to give you a bit of info about the recipient of this project. My friend, Shirley, has a DH with lots of tools and know-how. When we gals say, "Wayne, could you make this"? he jumps on it so fast that our heads spin........as was the case with this fabulous bow-maker. Shirley and I had seen some ideas on You-Tube, of how to tie bows using dowel rods, pins in styrofoam, etc. So, we asked, and he created. I used my uber fabulous Kraft cardstock (have I ever mentioned how much I totally LOVE Kraft? ), and created a bench for him, complete with a little bow maker just like ours! The 'birthday card' is in the drawer, where a gift card is supposed to go. The stamps I used for this little card are from Skipping Stones. I thought they'd be perfect for a humorous card. I am entering this project at Craft Your Passion. Challenge #81 is to use Kraft. 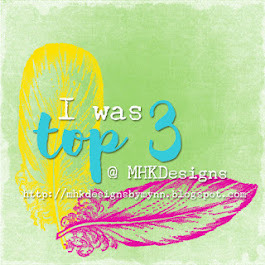 I'm also linking it up to Inspire Me Friday's on Maria's blog! Well, that's all I have for today. I'm planning to enter this in the challenge at The Kraft Journal. Then it's on to the laundry! Thanks for dropping by - have a good day! Food for thought: The best way to make yourself happy is to make someone else happy. Hello everyone! What a glorious day it is here in Missouri! We are on our way to the airport in just a few minutes to pick up our grand-doggie, Wimpy, who is flying in all the way from Los Angeles, to spend a few weeks, or perhaps a few months with us! His 'dad' has to be in and out on travels to many places over the next few months, and none of us could stand the thought of his being in a kennel that long. So, pops and I are grand-doggie sitting! I'll be sure to snap a photo or two. He's a beautiful white shepard/husky mix, and we just adore him. This is a die cut from Creative Cuts and More. I literally folded on the pre-scored lines, assembled, and decorated! Wow! They have the best die cuts! And if you go there and don't see what you are looking for, be sure to contact Terri, the owner, as there are probably hundreds or more that she has that are not on the website. As for decor, I had these little spiders in my stash, pulled apart and sponged black ink on a cotton ball, used two $1 stamps from Michael's that I've had forEVAH, and the DP is from Echo Park's Apothocary Emporium Collection, and was a gift from my friend, Shirley. Found the eyeballs at Walgreens, and couldn't resist them! That's it for today! We've had a productive weekend - got lots accomplished, found DH a new cell phone, had dinner with one of my sis's and her DH, got to talk to DD a couple of times, got to talk to DS a couple of times, AND the Cardinal's won game 2 of the World Series. Life is pretty good!!! I almost forgot! The winner of the extra magazine is #1, Becky Dunham!!! 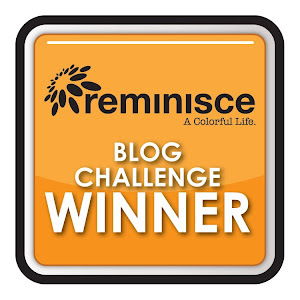 That never ever happens - #1 is almost never a winner - Congratulations to Becky!!! Email me with your mailing address :) I'll get it out tomorrow! Hope that things are well in your little corner of the world! Thanks for dropping by to see my creepy creation. When we get in this evening, I will try to visit all of you! I delivered water samples to the lab for DH today (3 hours round trip), had lunch with Shirley, and got a few groceries in. Then, I came home and played with purple paper! What did you do for fun today? 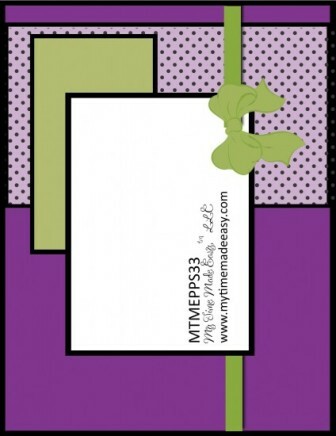 Today's card is for the Purple Challenge at Impression Obsession's Blog. I used an Impression-Obsession sentiment, "Peaceful Season Wishes". Sadly, I have a very limited supply of I-O stamps, so you will find me using the same stamps over and over! Tim Holtz Dusty Concord Distress Ink was used to stamp the sentiment. The snowflakes are punched with a punch I have had for years, and there is no manufacturer's name on it. The center of the snowflakes have one of those little sparkly snowballs - sorry, don't know who makes them either! The weekend is just around the corner - hope that you have something fun planned. I'm pretty sure that our weekend will include B*A*S*E*B*A*L*L - Go Cardinal's!!!!! (So sorry Ranger fans, I do love my Redbirds, and you simply have to love our Rally Squirrel! 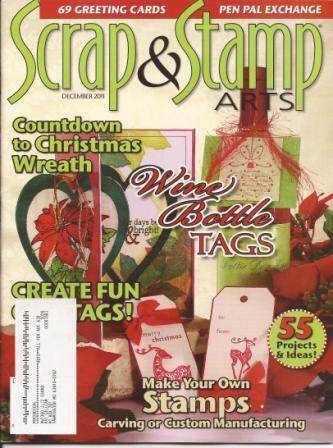 A few weeks ago, this issue of Scrap & Stamp Arts magazine came out. I was lucky enough to have a tag in it. I subscribe to the magazine already, and S&SA sent me a copy for having something in the magazine. I now have two copies! I'd love to send a copy to someone that doesn't have one! Please leave a comment here on this post. No rules or regulations - just tell me that you would like to win! On Sunday, October 23rd, "Random dot someone" will draw for a winner! Have a good weekend - Hugs and blessings...Patti J. It is raining and pretty chilly in Missouri. Guess I can't complain, since I complained about the dry hot days this summer! Hope it's nice where you are. I have a meeting to get to, and dinner to cook, so this will be a short post. I have a couple of very quick and fun cards to show. A few days ago, I wrote that I was going to Shirley's to stamp (and drink oh, so yummy coffee). We got out her Amuse stamps, (she's a demo for Amuse) and pretty much exactly cased this card right out of the catalog. We each made some changes, but the card in the catty was our model. I'm sorry, I can't recall which color ink we used, but it was brown. All of the stamps, inks, and cardstock are Amuse products. We each scored the lower section of our cards (but in different directions!). There's not much to color on the Amuse images, so I'm thinking they would work well for a mass produced card. Next up is a fun card using the Doodle Pantry Cowboy Birdie. This is a pre-colored image, and the DP is also pre-colored and from Doodle Pantry. I think I got the twine at For Keeps Sake in St. Louis last winter - not sure. If you need cards that are both fun and a fast creation, you should check out the Doodle Pantry Store! Food for thought: Sometimes life gives us the test before we have time to study the lesson! Happy Fall Y'all Blog Hop! to participate in their Happy Fall Y'all Blog Hop this morning! If you are just here visiting, you may want to go to Lori's blog, for the start of the challenge. If you are on the hop, and have come here from Sarah's blog, you are in the right place! For this hop, I chose to work with the Digi Set, Sweet & Spicy. The background is some of Trudy Sjolander's fabulous design work! Image, sentiment, and background paper can all be found at Clear Dollar Stamps. The only embellies used were a touch of glossy accents on the apples, and some StampinUp! ribbon. I tried to make this card pretty clean and simple. Hop on over to Lisa's blog, to see what beautiful masterpiece she has created for you today! New Digi Release at Clear Dollar Stamps! 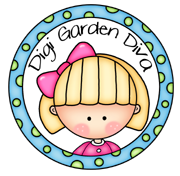 Today is release day for all of the fabulous new digital images at Clear Dollar Stamps! You are going to love this month's great images! I'm going to keep this short and sweet, as I know you are eager to see what the rest of the Design Team has to show today. My first card features a pre-colored set that is designed by Trudy Sjolander. The sentiment says, "Time spent with you is always sweet". The designer paper is also from this month's new releases. The doily is from Deals, and is sponged with Tim Holtz Distress Ink, Broken China, as are the clouds (Dienamic Dies). The tiny hearts are actually cut out of the doily. Next up is the March Flower of the Month set. I think it's pretty self explanatory. All coloring is with Copic Markers, and the border punch is Martha Stewart. Thanks so much for stopping by! Hurry over to the Clear Dollar Stamps Store, and check out all of the other new releases. The rest of the Design Team have beautiful projects to show you as well! I have a couple of quick cards to show today - I promise not to jabber your ears off. The first card is a Christmas card, and uses the Merry Mistletoe set from Doodle Pantry. The blue background paper is from the Merry Mistletoe set. The mat is a silver swirly cardstock from my stash - don't know who makes it, but I thought it would dress up the CAS card a bit. Don't forget that you still have lots of time to enter the Doodle Pantry Digital Challenge #17! Just for entering the challenge, using a Doodle Pantry Image, you will receive the adorable Quirky Penguin set free! The next card is All That Scraps' C.C. Designs Tulip Trevor taking flowers to his sweetheart. The background and butterflies (Martha Stewart Punches) are from the Echo Park Victoria Gardens collection. All coloring is done with Copic markers. Pearls are Kaiser Crafts. Ribbon is from Hobby Lobby. I am going to enter this card into the All That Scraps Wednesday Challenge: Anything Goes. I will also enter it at Flutterby Wednesday's which is an open challenge this week. Just have butterflies, fairies, or angels on your project! I want to thank all of you who have been emailing and sending things for the No Kill Shelter's pet themed craft corner. Every single image, stamp, charm, ribbon, etc., is greatly appreciated! Happy Friday - I hope that you have a great weekend ahead of you! and then those that we just love? Hee hee, well today's little card is one that you can't help but fall in love with. A couple of weeks ago, my friend Shirley came over to 'play'. We had seen a video on the Hero Arts blog, where they made a cute little tri-fold window card, and we just had to make one! She had also just signed on to be an A muse demonstrator, and had new Halloween stamps to play with. We were in stamping heaven! It always amazes us how we can make the same thing, with small variations, and such different results! Images, cardstock, bat die cuts, sentiment - all A-Muse products. Ink is Tim Holtz Distress Ink, Ribbon from my stash. Edited: This is 9" x 3", and is scored at 3" and 6". Now, I hope that you will stop over at Shirley's blog and leave her a little bit of love! Her card is totally adorable! She used a different image, and shaded a bit differently, and it turned out so cute!!! Hope this teensy little card gave you a smile, maybe even a giggle! Do you love Kraft like I love Kraft? Sorry I don't have anything to share yet this morning, hope to have something finished by this afternoon and will post as soon as I can. I'm actually working on some challenges!! 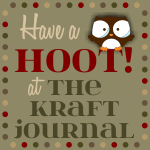 In the meantime, if you love Kraft like I love Kraft, you need to go check out The Kraft Journal! You can shop there, you can look at fabulous creations there, and you can win prizes! Woot woot, or in this case, Hoot hoot!!! Hope to see you back here later today! I will have something REALLY fun to share tomorrow! My bestest ever stamping friend and I created something together and are posting together tomorrow!!! Sweet Little Angel and HELP! Goodness, does anyone know who stole Monday from me? Well, hello there, and Happy Tuesday! Have you been over to Inspired Stamps yet to look around? Well...if you like love adorable images with ginormous, beautiful eyes, you're going to like it there! 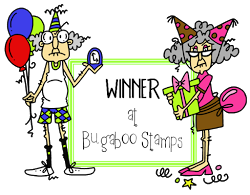 and was the lucky winner of the Grand Prize, which included this darling stamp set. This little guy is called Choirboy/Angel, as you have the choice of using the wings and halo. Well, I decided that for today, he'd be an angel, so here he is, in all of his glitter! All coloring with Copic markers, CS=Bazzill, DecoArt Glamour Dust, irridescent twine from my stash, Tombow Mono-Glue, and Scor-Tape. I hope that you will hop over to Inspired Stamps and take a look around. They have the cutest little soldiers, a nativity set, and many more. So, are you curious about the plea for HELP in my title? Recently, our No-Kill Animal Shelter was nearly shut down, due to non-compliance of their sewage system. DH and I decided that we couldn't let that happen. DH's job there is nearly finished. After 5 months of working every weekend, he's built them a new plant, which became operational last week. On the flip side of this, I have become active with the shelter itself. and was just asked to coordinate a pet themed craft corner on the Thrift Shop side. Here's where I hope you can help...I have very few pet-themed craft items. IDEAS!!!!! If you have any wonderful ideas for a pet related item, PLEASE feel free to share! I hope this helps give you an understanding. Basically, we need to be able to create a variety of pet themed items, so any items or ideas, would be appreciated. Also, if you happen to LOVE to sew and have idle time, we'd love to have pet sweaters, jackets, hair bows, etc., as well. It is our goal to have enough inventory to open up the corner at the annual Open House to be held at the shelter on December 3rd. Food for thought: The longer we carry a grudge, the heavier it gets. The October Releases for Doodle Pantry are Here! It is release day for the new Digital Images at the Doodle Pantry Store! Every month, I think that Laurie has outdone herself, and every month, she does it again. This month features more "Quirky" goodness, a bit of Vintage, a bit of fall, a bit of Christmas, and you will smile out loud when you see the mischief those little ants are up to! I was lucky enough to get to create with Scarecrow Birdie this month. I made this wonderful card portfolio with a die cut from Creative Cuts and More, and filled it with cards. If you've never been over to CCM and looked around, you simply must go. The beautiful green DP is from the Scarecrow Birdie set from Doodle Pantry. I used the Spellbinder Metals sheet in copper for the Doodle Pantry sentiment - pretty cool! I've had these metal sheets since April, and just now became brave enough to give them a try. Or perhaps I was saving hoarding them. Whatever...I think they are beautimous! I thought this sentiment was so much fun! Isn't this DP the best? Looks embossed! It's part of the Scarecrow Birdie set! 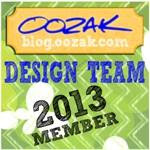 I have one more quick creation to show you, using the pre-colored Holiday Ants from the Doodle Pantry new releases! What fun - those ants are having a great time, as always. Ha ha...it says "Not a creature was stirring....Oh never mind, the ants were stirring". Printed the image, added some Broken China Tim Holtz Distress Ink around the edges, and some Diamond Dust Glitter around the edges, on the ornament, and on the branch. 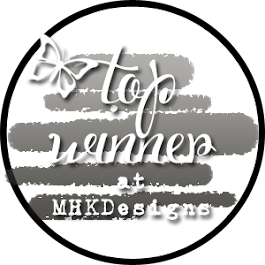 I hope that you will head on over to the Doodle Pantry Store to see the rest of the new releases, and please be sure to check out what the other member of the Design Team have to show you today. You are going to want them all! During the month of October, the Quirky Turkey set is free with purchase (I love 'free')! What fun you could have with that Turkey set for your Thanksgiving get-togethers!